Behind the street where I live in East London, there is a patch of greenery; not quite a park, it feels more like a leftover space, a rectangle surrounded by main roads, the Regent’s Canal and a gin distillery. 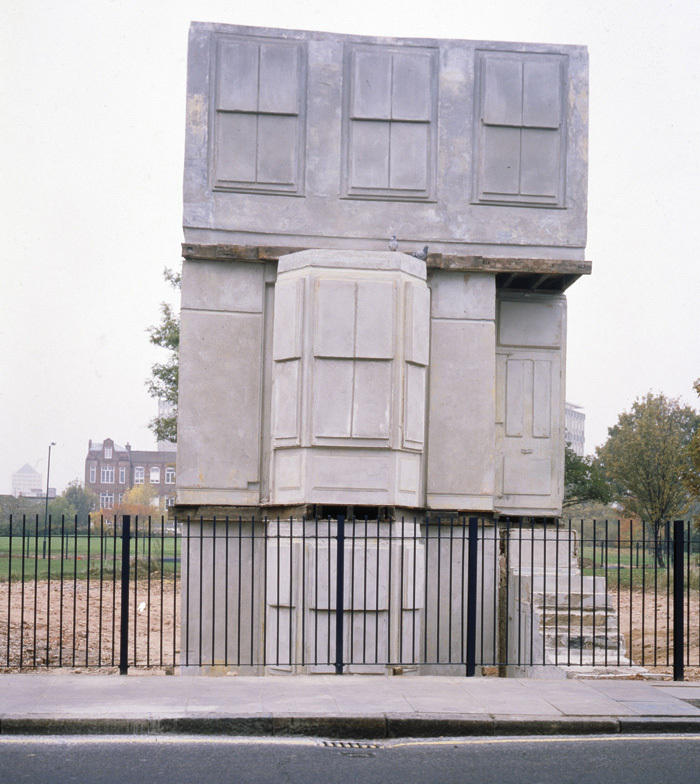 But it is on this unassuming rectangle that British artist Rachel Whiteread created her most iconic work: House (1993). An architectural sculpture cast in liquid concrete from the interior of a terraced home slated for demolition, House stood as a powerful symbol of the area’s heavy-handed regeneration, and the spaces and memories lost when such processes take place. 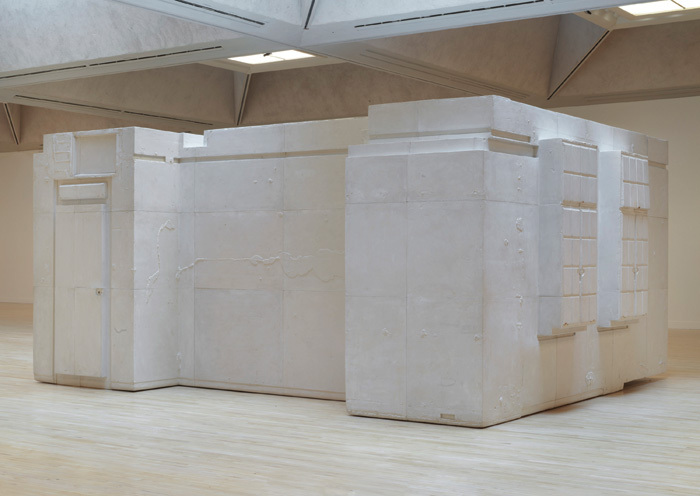 Though the building structure was removed, along with the other houses in the terrace, Whiteread turned the negative space within it — the container of life and of past — into a presence in its own right, half monument and half tomb. But then this was removed, too, leaving an empty plot of land. Although it is thankfully now open public space rather than the site of new ‘luxury’ developments, I can’t help but think London’s art culture would be all the richer if the local council had been brave enough to keep House standing. And yet, if people’s homes hadn’t been demolished in the first place, Whiteread would never have felt compelled to create the work — and therein lies its poignancy: just as homes and structures are erased from a landscape, so too is her work. If Whiteread’s ouevre is about one thing, it is absence. House is documented in a series of photographs and plans as you enter the Tate Britain’s new monograph of the artist — curated by Ann Gallagher and Linsey Young, and spanning three decades of Whiteread’s work — alongside a separate image series, titled Demolished (1996), which records the demolition of tower blocks on three separate housing estates in East London between 1993 and 1995. Unfortunately, these works are in the same space as the gift shop, feeling separate from the exhibition itself, and as a result receive less attention. The most striking element about the curation for this show is that it is presented in one large room (1,200 sq m). While this is par for the course for smaller galleries, it is unusual in more traditional institutions such as Tate Britain. There are benefits to the approach: the works are able to relate to and contextualise one another in ways that are not as possible in a series of separate rooms; and the visitor can experience the works in their own order, curating their own exhibition journey. But there are also drawbacks: the tactic serves to impress a somewhat underwhelming experience and reduce the potential for immersive one-on-one encounters with larger-scale works such as Book Corridors (1997), Untitled (Staircase) (2001) and Room 101 (2003). The installation further enforces this lack of immersion, intentionally or not, with each work protected by an invisible protective area that beeps shrilly even if you approach it. Something I felt lacking in the curation of the show was the interaction with architecture. Architectural context is often key for Whiteread’s works, from the Holocaust Memorial installed in Vienna’s Judenplatz and House in its demolished residential terrace, to Embankment (2005) in the warehouselike space of Tate Modern’s Turbine Hall or Monument (2001) on Trafalgar Square’s fourth plinth. Where things are placed and how they interact with their surroundings give resonance to so many of Whiteread’s works. Luckily this is achieved at least once in the Tate show: Untitled (One Hundred Spaces) (1995) has been installed in the Duveen Galleries (South), the central neoclassical space of the building. Whiteread deliberately arranges the work in different formations depending on the space it is in: here, in the lofty arched galleries designed specifically for the display of sculpture and punctuated by screens of Ionic columns, the Whiteread signature of the immersive encounter is at last present. 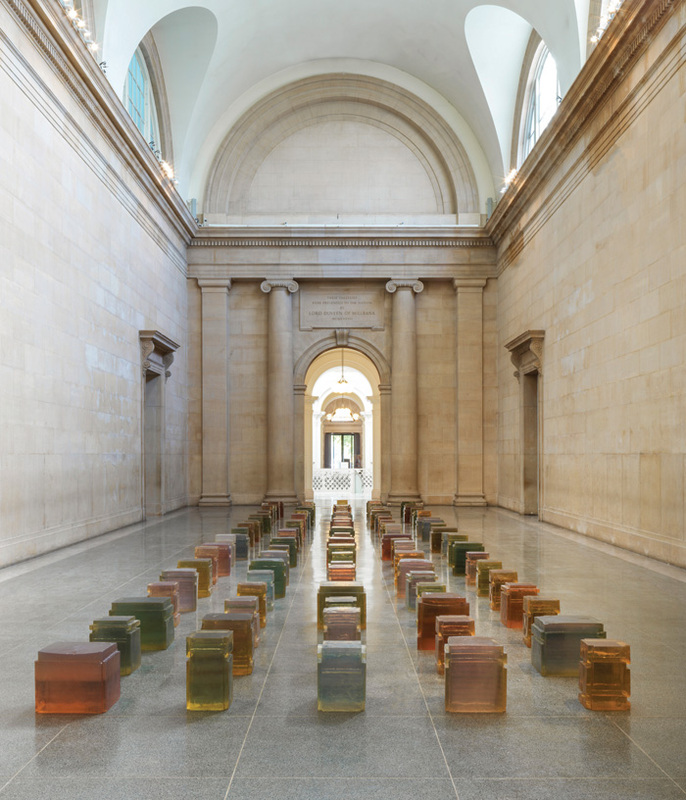 Cast in variously coloured resin from the spaces underneath chairs, the work is laid out in five long lines, reflecting the 91m-long stretch of the space, its gem-like hues playing with the warmth of the stone walls. It dominates the South Gallery, becoming a part of the space in which it is set. Still, there is much to observe in the main room, with its odd ensemble of casts: traces of domestic forms and objects, from fireplaces, doors, windows and tables to slumped mattresses, toilet rolls and hot-water bottles. Space made solid, memory given form, Whiteread’s sculptures form the residue of everyday life, often inflected with a startling aura of intimacy or melancholy, such as with Shallow Breath (1988), one of her earliest works that cast the space underneath the bed on which her father died. Whiteread’s preoccupation with the domestic in the majority of her works serves not only to challenge the canonical relationship between women and the home in art, but also to evoke a consideration of how the spaces and objects of the home are the most powerful vehicles of memory. It is the banal, everyday forms of our domestic environment that contain, witness or support our lives, from birth to death, through loss, joy and change. ‘[My work] always has this emotional beginning,’ Whiteread told The Guardian in 2005. She has cast spaces in her home before they change, or objects associated with her parents before they died. Whiteread’s compulsion, if not obsession, to record spaces and objects before they disappear imbues her work with this underlying sense of dread — of loss, of change, of mortality. Materiality, too, is vital for Whiteread, both as an aesthetic, unifying force and a tool to heighten the viewer experience. Her range of materials is restricted — and somewhat Beuysian in nature: resin, plaster, rubber, concrete, wood, metal. But Whiteread has gone in a new direction for her most recent works included here. The works Wall (2017) and Roof (2017) cast shed sections out of papier mâché, a departure from the heaviness of earlier works, which feel suffocating as they leave no space to breathe. The sculptural forms here are thinner and lighter — they look as if they could disintegrate at any moment. The papier mâché was created out of the stacks of waste paper and old drawings in Whiteread’s studio; having used the medium for her very first casting experiments, she has returned to it decades later. While usually the traces of memory and past are represented by the spaces cast by Whiteread, here it is the method and material used instead that become the symbol and residue of the artist’s career and life. Though Whiteread, born in 1963, found herself part of generation YBA in the Nineties, and was the first woman to win the Turner Prize (1993), she has shunned the trappings of fame, preferring to leave the socialising and media interviews to contemporaries. But like I said, absence is what her work is all about.